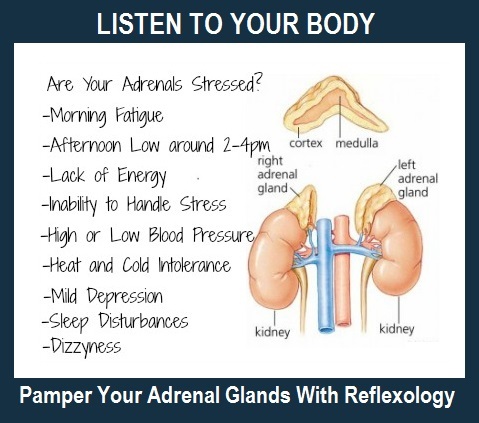 The Adrenal Glands sits like a tiny pyramid on top of a kidney and are about the size of walnut. These powerful little hormone producing glands manufacture and secrete almost 50 different hormones. They are what helps keep your body’s reactions to stress in balance. Location: The reflexology point for the adrenals is a small circle located above the Kidney point. You have one on the sole of each foot, at the center of the arch (see illustration). Conditions Aided by Massaging This Point: Adrenal function, stress, anxiety, anger, & vitality. Treatment: Begin by kneading the center of the arch with the heel of your hand. Then make a fist and roll the knuckles from the arch toward the heel, gradually increasing the amount of pressure. Press one knuckle into the Adrenal Point, massaging in a circular motion. Finish by holding your thumb firmly on this spot for about 30 seconds. Repeat reflexology treatment on the other foot. Beneficial Essential Oils: To enhance results, you can use massage oil or lotion that contains essential oil of lavender, orange or rose 100% therapeutic essential oil to reduce stress.